Yeah that seems fun for small events. But I’m thinking about swiss->cut mechanics in general. Is the idea that each bracket plays two rounds, then the winners of each play for a final winner? 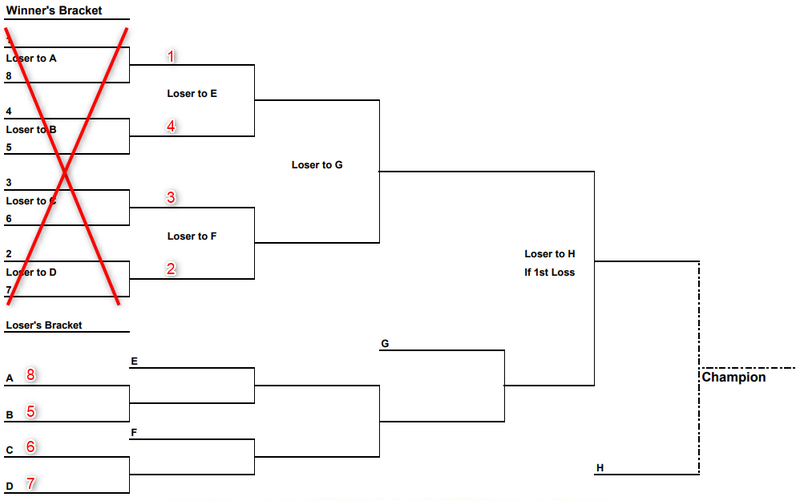 The idea is to play DE bracket as usual, but simply skip the first round. Seeds 5 to 8 need to loose only once and they are gone. 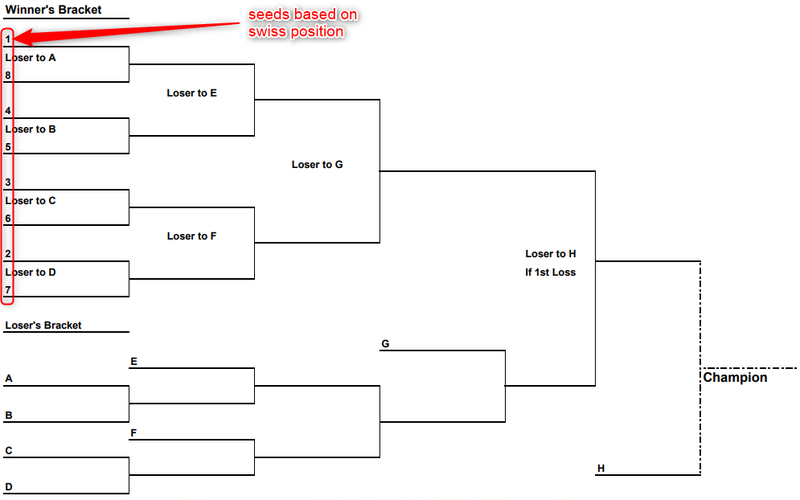 Seeds 1 to 4 need to loose twice to be eliminated. That’s additional something to play for during the last swiss rounds (ID hate) and -40mins of total DE bracket playtime. I think the Winning Agenda talked about it as part of the ANRPC SanSan qualifier or something. No idea about the outcome. And I have to say, I like the idea! But considdering really big tournaments is that really something to apply? My feeling is, this is good for medium size tournaments up to like 70 people. Why wouldn’t it be good for big tournaments? my feeling is this doesn’t make so much sense, assuming 8th is better then 9th as losing 1 compared to 2 games makes a big difference. Well, same thing regarding making the cut or not. But additional prize for getting to top half of the cut makes final swiss rounds more relevant. I get your point, but I would be willing to pay the SoS price in order to limit IDs. I wonder if the points would have been so closely grouped if people were IDing less though? And would they ID less if they knew that 1-8 had a significant advantage in the cut versus 9-16? Here’s a radical idea; why not have everyone play the same amount of games? No cutting. Because then you will have final results based purely on SoS. Round robin every tournament is the only way! Worlds to last several weeks. And? Where’s the problem with that? Swiss and SoS works just fine for the BloodBowl tourneys I attend and the largest ever (1418 players at last count) is happening in October with Swiss and SoS. It works. Everyone gets to play the same number of games (the part of not playing all the games you’ve paid to play is what’s massively wrong with cutting players out). I’ll be honest, a cut in a game with two sides just doesn’t make sense. Losing to SoS (or even worse, eSoS) can feel unsatisfying, and an elimination round helps resolve this. I don’t know if you feel you haven’t gotten value for money for your entry fee after 5 rounds of swiss, but personally I find it quite tiring, and I admire people with the stamina to fight all the way through a top cut as well. Aren’t we missing the article from Monday? Don’t want to push, just let you know at least I’m waiting. It’s currently being edited, should be out today I hope. One of the things that keeps coming up is that we’re causing ourselves problems by sticking to strict arbitrary deadlines - there will be an article about this coming up soon too! I think this is where we have a slightly difference of opinion - I don’t see it as “Pay X to play Y games of Netrunner” but as “Pay X to enter a tournament, and get as many games I can win the right to play”. Then do away with Swiss altogether and have a pure knock out system. People like the excitement of a cut and seeing a bracket fill out. Swiss is, however, one of the best ways of figuring out the best players in the room on the day. I think the idea of mixing them is that you get the best bracket you can make. Games are less likely to be lopsided or come down to pure luck, so the severe nature of a double elim is less likely to knock out a contender who didn’t ‘deserve’ to win in the first place. Several pro sports do something akin to a Swiss/Cut. FWIW, so does MTG. It’s sort of a proven thing. The main thing I want brought over that uses this argument is how Chess determines who plays White. Could use it to determine who plays Corp. 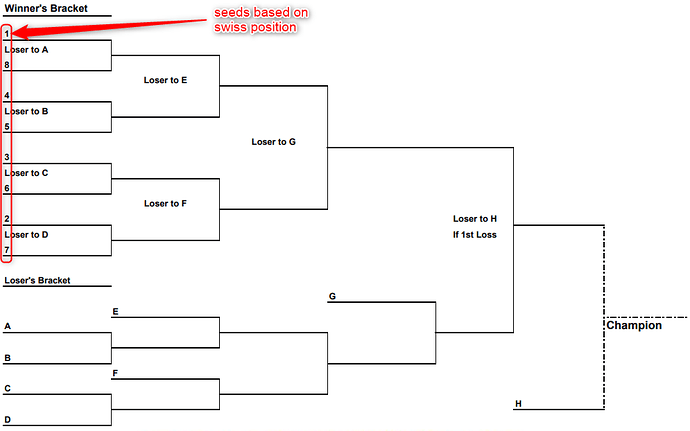 The math for how tournaments work is so difficult and convoluted with a 2-game-match structure, that fixing it to making it 1-game-match structure has the potential of fixing other issues, such as IDs. If anything, the worst effect from this is that you’re playing with one person less, so you get less social aspects of the tournament.